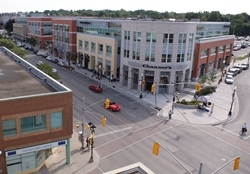 City in Brief: Located in Southwestern Ontario, Waterloo is the smallest of the cities that make up the “Tri-City” region of Kitchener-Waterloo and Cambridge. The city is home to the University of Waterloo and Wilfred Laurier University, which has contributed to its knowledge-based economy and thriving technology sector. The dominant technology company in the city is Blackberry, which remains Waterloo’s top employer.